Update, June 6, 2009 – This post … well, it’s garnered a bit of attention since I posted it about a week ago. I don’t really know how people are finding it, but they’re finding it. And to be blunt, not everyone’s agreeing with what I wrote here. I won’t rehash my opinion in this update; I already posted it in the comments among both agreeing and disagreeing responders. However, I’ll approve any comment having merit while also not being insulting. So go right ahead and post your own opinion, negative or positive, on this particular restaurant. Y’ll kinda have me curious now! I’ve been avoiding posting this one. I don’t like talking badly about restaurants. But this one has irritated me, and I have to explain why. When you’ve driven extra miles, more than 150 miles one-way from the hotel you’re staying at, to eat at a single restaurant that’s in the middle of literally nothing, on a man-made island of a project once listed as one of the seven engineering wonders of the world by the American Society of Civil Engineers … wouldn’t you expect to find the best Crab Cake Sandwich you’ve ever had, even if it was just for lunch? I gotta tell you, I was sorely disappointed. 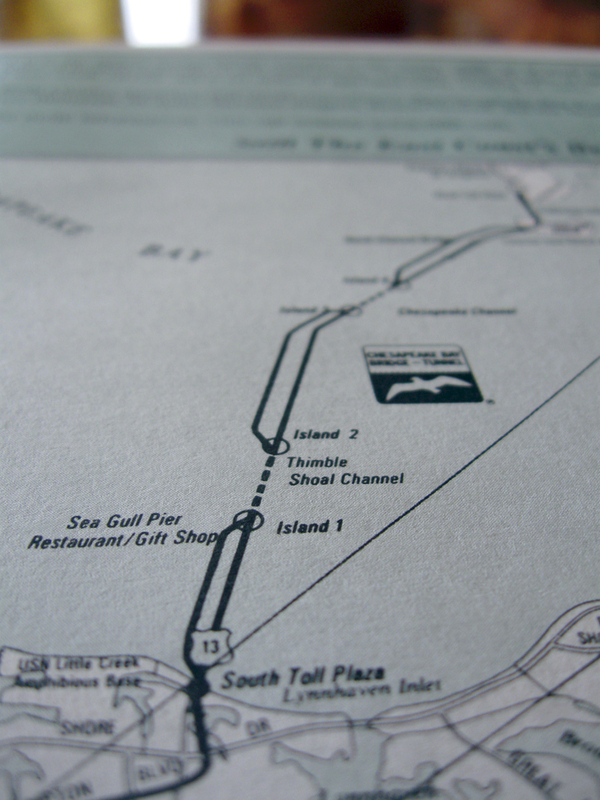 Granted, we weren’t disappointed with the Chesapeake Bay Bridge Tunnel itself. And there are a couple other pics you have to see at the end of this post. But frankly, the Filet’o Fish at McDonald’s is better than the crab cake sandwich you see here. The $9.95 “Crab Cake Sandwich with french fries” at the Sea Gull Pier Restaurant on Island 1 of the Chesapeake Bay Bridge Tunnel wasn’t anything close to what I was expecting for either the price or the location. When the dish was delivered, it was exactly as it appears in the top photo; An overcooked (cooked at least twice the time it should have been) crab cake on an inexpensive (read, “cheap”) bun with a portion dish of tarter sauce and some slightly soggy fries. Not even a slice of lettuce there to put on top of it. Definitely nothing close to what a good Chesapeake Bay crab cake should be, is supposed to be, is expected to be, etc., etc., ad nauseum. My real problem with this isn’t the dish itself. It’s how that poorly-made dish relates to those miles driven. People consistently travel long distances to see the Chesapeake Bay Bridge Tunnel, to drive those 20 miles of pavement 20 feet over the waters at the mouth of the Chesapeake Bay, to get off on Island 1 to see the fishing pier, visit the gift shop and eat at the Sea Gull Pier Restaurant. I know because I lived in Norfolk for over three years, and two of my kids were born in the area. And this was still my first visit to this particular attraction and Engineering Wonder. My real problem is that this sandwich, and anything else served at that particular restaurant, should solidly represent the seafood of the Chesapeake Bay. Unfortunately, it does not do so, not by a long shot. Honestly, when I bit into the sandwich it was ok, and I was instantly suspicious of the meat being a Chesapeake crab cake from Phillips, which is a wonderful product. If so, that would have been the sandwich’s only saving grace, as Phillips is the way to go in many cases for decent seafood for this purpose. But even it it was, somebody had cooked the Hell out of it and served it up very amateurishly. The result was far from representative of what even that particular seafood supplier would want to see for that product. This is my stepson Pfc. 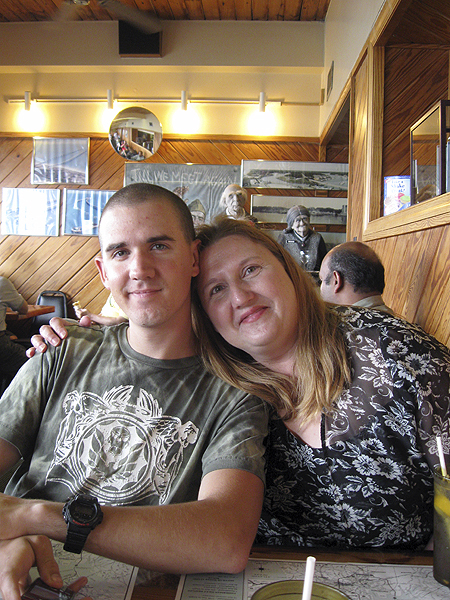 John Winckowski, USMC, and his mom, my lovely wife Mary, at our table in the Sea Gull Pier Restaurant. Memorial Day weekend with a U.S. Marine. Yeah, that’s the ticket. 🙂 John loves watching the “engineering marvels” shows on various cable channels, so heading to the Chesapeake Bay Bridge Tunnel was something he’d looked forward to. I’m pretty sure he enjoyed the rest of our visit to that “enginering marvel”. 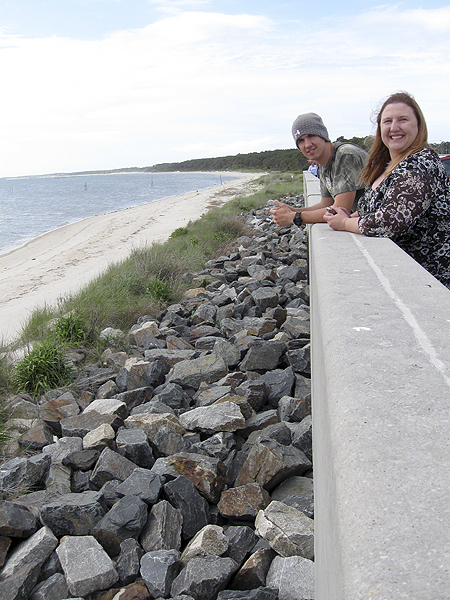 John and Mary also posed for me at the overlook that looks to the west at the Chesapeake Bay at the far east end of the Chesapeake Bay Bridge Tunnel. And for those of you who are fishermen or fisherwomen who want to fish the Chesapeake Bay without a boat, here’s a look at the fishing pier just outside the restaurant on Island 1. 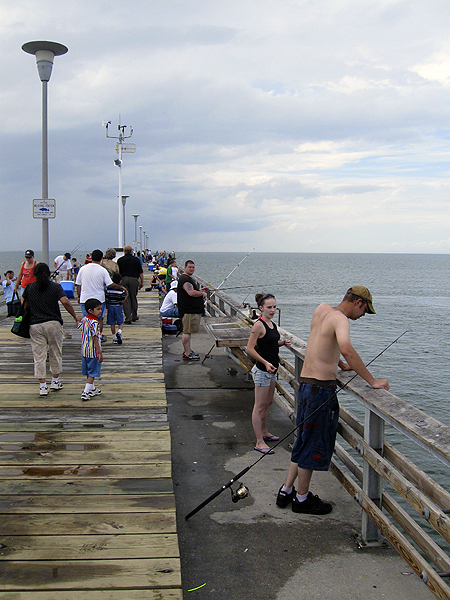 But if you do fish off this pier, do yourself a favor; Pack a lunch. Too bad you didn’t check with the ‘locals’ first. Sea Gull Pier Restaurant (and, ‘Restaurant’ is a most generous description) is nothing but a tourist trap, and one of the more vile tourist traps in the area, in my opinion. There are one hell of a lot more BAD crabcakes in the Chesapeake area than there are GOOD crabcakes. Sorry you got ripped off. Sorry you had such a bad experience at the restaurant. Chesapeake Bay seafood, when done right, should provide a much better experience. Take care. DC, you have to remember I was a local once. But the point of the trip was to visit the bridge, so eating there was secondary. I’d have been more upset it if was the primary reason for going. Wishbone, I love Chesapeake Bay seafood and have had a lot of the seafood there in both Maryland and Virginia. Evans Seafood, in southern Maryland, used to be one of my favorite seafood dives! I kinda miss it. I must respond to this review and its comments. I travel extensively throughout the wonderful states of our country, but concentrate on the east coast area. I have eaten in every small town along the way, as well as five star restaurants. I have eaten at the “pier” and actually will drive 100 miles hungry to eat here. Its too bad you had a bad experience, and only one thing on the menu. I have had their wonderful flounder sandwich, which i challenge you to find a better one. It is very satisfying and huge. You fail to mention they have freshly made chicken salad, shrimp salad, freshly breaded oysters and scallops. There is a wide variety of items on the menu and i have tried most of them. Perhaps you should have tried your crab cake baked, after all it is very thick and to fry it means you have to cook it longer, to ensure it being done on the inside. Your attack of this restaurant is so over the top, one has to wonder if there is something personal going on here. I would suggest you try it again, because from my point of view, and many others I have spoken to, this little place is a “gem” in the middle of the chesapeake bay. (and i might add that the gift shop is not “a vile tourist trap”, but a most delightful shop with some of the most unusual items i have ever found in a gift shop on a tourist stop. Tell you what; John’s assigned out that way for some time, so I’m sure we’ll be back out on that bridge at some point. I’ll take you at your word and try again. I’m not sure when that will happen, probably not for some months. But I will do so, particularly since a flounder sandwich sounds rather tasty! Really, thanks for your response. I am thinking that for every one comment like yours, there are twenty that are different. Still seems like you are beating them up. Just because you got a sandwich you didnt like you wonder about the kitchen? yours was but one opinion, so you didnt like it, how does your taste (or lack thereof) make you wonder what else might be “bad”? One bad sandwich should not make you question the integrity or consistency of a kitchen. You say my comment may be over the top, you went to great lengths to trash this place, my best instinct says this still may be personal. I hope you do try it again, i would love to see you “eat” your words..
Ok, here’s the thing; I’m approving your comments because I feel you’re entitled to your opinion. I won’t stop approving them because that’s still true, and I’ve certainly respected your opinion here. So, why have no respect for mine? I said I’d go back and I mean that. There’s no need to be mean in return. I’ve cooked in kitchens, I know what it means to work with people in good restaurants who simply don’t care about being consistent. But you asked me to go back there, and I will, out of respect for your opinion. Until I go back though, there’s no way for me to do anything but agree to disagree with you. I hope that makes sense. i couldn’t resist adding my opinion regarding tha seagull pier: first i always find it to be a real feel good experience from tha moment i walk in tha door. i am greated warmly with genuine “hey, how ya doing, good to see you” just like i am family. tha staff desrves credit for their hospitality. as for tha food i find that so many places (mcdonalds, outback) all taste tha same which is good if your craving happens to be very specific. when you crave a warm friendly home-cooked meal which is not cookie-cutter pre-fixed but always delicious just open your mind and your taste buds to the seagull pier. they have in my 54 year old experience-eating opinion tha best chicken tenders, they beat the heck out of denny’s / ihop for breakfast any time of day for price as well as taste, and everything else on tha menu. as for the crab cake sandwhich it never disappoints me. i don’t eat the bread but tha cake is always good because it is tha way they make it. don’t get me wrong cuz i love me some crab cakes from outback, but the tha true experience in enjoying a good meal starts when i enter tha door before i even order and their homecooked food really makes me feel like tha seagull pier is a dying experience that people discount because they are expecting everything to be tha same which we all know is boring so here is to that personnal spice of life tha seagull pier has to offer. thank you for providing me with some food for thought;getting hungry? i am and i’m heading for tha pier. Well your opinion is just that, yours!! 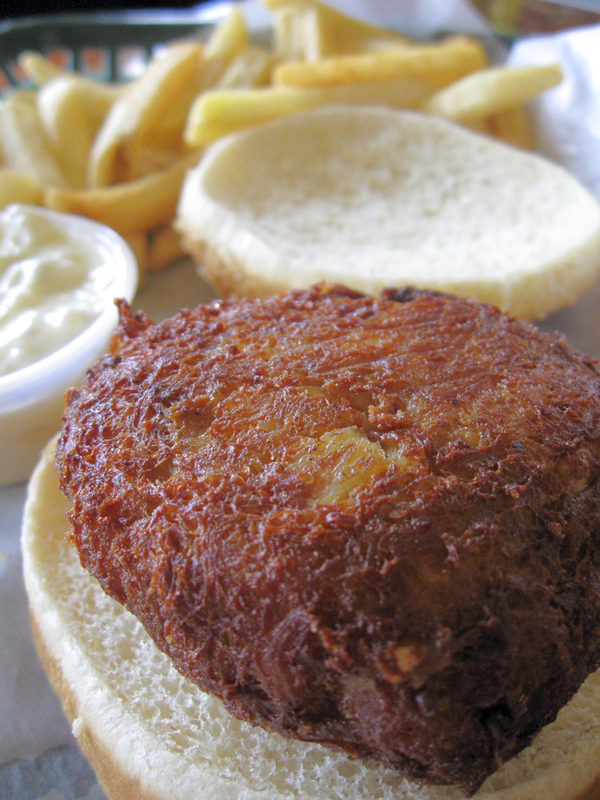 I have read the other thoughts of people and have to agree, crabcake is not my favorite from anywhere and fried seafood isn’t either….but, that fried flounder sandwich is the BEST fried fish I have ever indulged myself with. So it is good to hear that you will try out the Seagull Peir Restaurant again and maybe your shared thoughts will come across differently!! Tahnks for your time. Dave, obviously I do not need to tell YOU this, but for some other readers, it is very apparent that some serious shilling is going on here. I mentioned your website while having a cigar and a drink at the Avalon’s clubhouse this afternoon. We called up your site and projected it on the big screen. The reactions from the group of folks at the luncheon (people who live, work, and dine in the Chesapeake area — and who have visited the SGP establishment) were unanimously supportive of your original assessment and resulted in laughter among the golfers who read the preceding comments. YES, the power that “Google” has afforded some folks with a personal agenda is amazing. Where most restaurants around the Chesapeake get in trouble is when the deviate from the classic recipe; lump crab, mayo, bread crumbs, salt and pepper, pan fried. When red pepper chunks, onions, celery, etc are added, it’s no longer a crab cake. Strangely, the absolute best crabcakes I have had year after year I discovered by accident. They are served at the Four Points Hotel at Baltimore Airport. I asked the manager once if the great taste was a fluke and he said “we’ve been using the same recipe for 37 years, and our chef knows how to pan fry (or broil if you prefer). Ok I have to agree with you in part…their crab cakes were never that good, but their other food was wonderful. Sadly The Seagull Pier Restaurant has now been replaced with Virginia Originals and Chesapeake Grill. Now if you want to find a “vile Tourist trap” that is where you will find it. There food is nasty and its the same stuff you could get at any regular fast food restaurant. They are not prompt with service and they don’t know what they are doing. True they are new but they should have worked out any bugs in their system before the 4th of July (which is when I ate there). I would advise that if you are heading to the Bay bridge and are hungry to not put much hope in getting a good meal at this restaurant. I have to say something to this .. we travel between NJ and Va. because my son is stationed in Va. He is Navy man. We use to love stopping at the restaurant on the bridge..it was a nothing place with a sandwhich to die for.. Filet of flounder that left you dreaming of another .. and talking of the next trip to get another. One Sandwhich feeds 2..it was incredible . I even took a pic of it in front of hubby before we shared it. Last trip down it was closed..for renovations. This trip ..it was open. It should have stayed closed. Buffet breakfast?? Comeon… I want good fish when I am on the bridge.Not a fancy place with a whooptido gifty shop… I asked our waitress twice..is the fish sandwhich the same…she said “Yes it is just cut in half” twice. Hey, I have a pic of the original. Between 8 and 12 inches the pics use to advertise ..we got 2 pieces of BATTER fried Arthur Treachers or Long John Silvers fish. ( which would have been ok if I wanted that!) It was ok fish but not GREAT like they use to have. Batter fried? Come on .. I do know another place along 13 that we will stop at that has great fish and the BEST crabcakes we have ever had. It is also a little nothing place .. lol I will warn them not to change. I found out not all change is good. I have had my last stop at that place other than a bathroom stop. Flo and Debra, thanks for the info. It looks as though the new place won’t be redeeming this post anytime soon. I just have a question…I will be heading down 13 again in a bout 2 months or so and I was wondering if anyone here knows of a good restaurant in the Virgina beach area that serves good food that is local to the area and not something that you can go to Arthur Treachers or Long John Silvers for? If so can you post the address or at least the full name of the restaurant. Thank you. I see a lot of comments from people, who must live in Maryland, with their best crab cake resturants. I must throw, what i consider the best place in Va., in the mix. The place is Lowery’s Seafood Restaurant located in Tappahannock Va. Its not cheap, but the best i’ve ever had. We make the trip at least once a year from NC to NJ and the seagull was always a favorite for the unbeatable flounder sandwich,we were sad to see the place close for renovations because that always means its never as good as before.True to form after looking over themenu for the new place, as we thought,the flounder has been removed.I wonder how many other customers they lost by making the place new and so-called improved? For a true Chesapeake Bay experience, I took out-of-town guests to the Seagull Pier Restaurant. (it costs $12 to get onto the bridge) As I expected, they enjoyed the pier itself. It was a lovely evening; the water was calm and there was a nice breeze. I’m a local and rarely cross the BBT but these guests were special and I heard that the restaurant had been renovated. I can’t even express my embarrassment with the wait staff, the cold and lousy food, and the icing on the cake? …charged incorrectly. The waitress acted as though the manager did me a huge favor by correcting the check. Lesson learned here…next time we’ll go elswhere, to a place I’m familiar with so I know I won’t be humilitated! I was not at all disappointed with this restaurant. I had the fried oysters and sweet potato fries and I think it was awesome. I went in April 2016 with two well-known locals and they visit this restaurant all the time. In fact their house overlooks the Chesapeake Bay Bridge. I bought several items in the gift-shop and was not disappointed in my purchases. I even bought myself a cup with Chesapeake Bay Bridge printed on it because I was so happy with my visit. OK, I’m writing in late here to settle the score about something. First of all, I KNOW what a great flounder sandwich is, and I can tell you when I twice visited the Seagull Inn (PRIOR to it’s reconstruction and then permanent closing , sadly enough) I had probably THE BEST FLOUNDER sandwich ever. This was properly breaded and was real flounder, could have easily made two delicious sandwiches from it. Then, I stopped by after the remodel and asked the waitress specifically if the flounder sandwich had changed and was told NO. I could tell immediately when it was served it was different. Never went back after and now it is all gone. It was very sad to hear of it’s closing, especially just to accommodate more people traveling, as if we need more people crowding the roads.